During a visit to Germany on 9 May, Ukrainian President Petro Poroshenko met European Council President Donald Tusk. "The leaders agreed to hold the next 20th-anniversary EU-Ukraine summit in Brussels in the summer of 2018," the president's website said. 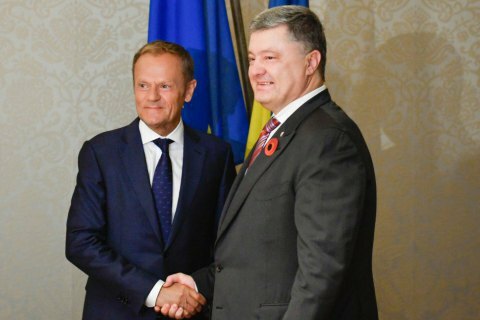 Poroshenko briefed Tusk on the situation in Donbas, the Joint Forces Operation and recent violations of the Minsk agreements by Russia. They discussed an extension and a possible tightening of sanctions against Russia. They also discussed Ukrainian reforms, including the creation of the Anticorruption Court, security reform, the implementation of the EU-Ukraine association agreement and ways of amplifying EU aid. The 19th EU-Ukraine summit was held in Kyiv in July 2017.